Fig. 1: Detail of the Roman Senate House, ca. 400 A.D.
Background: The UCLA Cultural VR Lab was founded in 1998 by Prof. Bernard Frischer in collaboration with Prof. Diane Favro of the UCLA Department of Architecture. The mission of the Lab is to create highly accurate 3D computer models of culturally significant sites around the world. Thus far, with support from INTEL, the Creative Kids Education Foundation, and several individual benefactors, the Lab has been focusing on ancient Rome. Models have been made of buildings in the Roman Forum and also of the Early Christian Basilica of Santa Maria Maggiore. The ROME REBORN project has been covered by the BBC, the New York Times, the Sunday Times of London, Business Week, Scientific American, Panorama, Espresso, the Associated Press, and Reuters. A segment of the project’s videotaped virtual tour of the Roman Forum is being shown at the London Millennium Dome in 2000-2001. Methodology: Differentiating the Lab from a typical graphics company is its commitment to the highest possible scientific accuracy. The first step in modeling a site is creation of a small Scientific Committee of the world’s leading authorities on the site. The committees are appointed by Prof. Frischer and are chaired by Prof. Favro. Members of Scientific Committees have included curators of the Vatican Museums, an American archaeologist who has excavated in the Roman Forum, and the Superintendent of the Roman Forum, Colosseum, and Palatine. Only when a Scientific Committee is satisfied that a model is as up-to-date and faithful as possible is it considered ready for release. Another differentiator of the Lab is its commitment to the high-end realtime 3D modeling software, MultiGenTM. MultiGen is a standard for realtime VR applications. General uses: 3D models of cultural sites bring the past to life for today’s students, scholars and tourists. The models can be put on the World Wide Web or used as interactive illustrations on DVDs or CD-ROMs. They can be used as “virtual sets” in television or film productions recreating a past event, providing a guided tour of a place that no longer exists, or creating the backdrop for plays or other works of fiction. 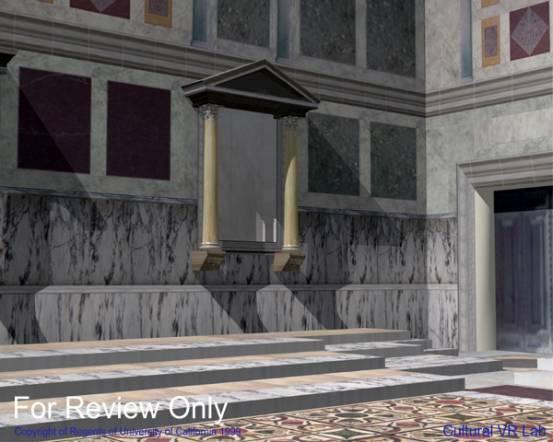 Educational applications by the Lab: The UCLA Cultural VR Lab itself maintains a Web site on which models are presented in lighter, Apple QuickTimeTM VR format, and that provides related scholarly and educational materials to facilitate understanding of the site and the related 3D computer model (see http://www.humnet.ucla.edu/rome-reborn). For example, the Rome Reborn Web site offers visual documentation of a site from antiquity to the present with images taken from the Fototeca Unione at the American Academy in Rome; ancient sources describing a site; plans, sections, and elevations of buildings on the site; bibliography; and (thanks to sponsorship by The Johns Hopkins University Press and Editore Quasar) articles from two recent encyclopedias: L. Richardson, jr., A New Topographical Dictionary of Ancient Rome (1992); and E. M. Steinby, ed., Lexicon Topographicum Urbis Romae, 5 vols. (1993--). All Lexicon Topographicum articles written in foreign languages are translated into English. All ancient sources (which in the original encyclopedia articles are normally just cited) are quoted in full with new English translations. Finally, in the Education Department, users can find QuickTime movies with segments from longer videotaped virtual tours of the sites modeled. In the tours, Prof. Frischer (who appears to be projected into the virtual world through use of Hollywood virtual set technology) walks through the models and explains the history, function, and rediscovery of the sites. Users may open a “Script” window, in which the text spoken by Prof. Frischer may be read. And important words in the script are linked to a related Glossary window. Meanwhile, the full video tour, in BETA SP or VHS format, is available upon request from the Lab at a nominal fee. Current project: “ROME REBORN,” a 3D computer model of imperial Rome. Projects in development: The Lab is developing projects to model sites in Greece and Israel. Lab affiliations: CINECA, the supercomputing center of Italy; the UCLA Center for Digital Innovations; the UCLA Humanities Computing Facility; the Index of Jewish Art; the American Academy in Rome; the UC Berkeley Virtual Reality Center. Endorsements of the Lab: These include the Hon. Francesco Rutelli, Mayor of Rome; Prof. Adriano La Regina, Superintendent of the Roman Forum, Palatine, and Colosseum; Prof. Eugenio La Rocca, Superintendent, Galleries, Monuments, and Museums of the City of Rome; Prof. Bezaliel Narkiss, Director Emeritus, Index of Jewish Art; Prof. Pauline Yu, Dean of Humanities, UCLA; Prof. Lawrence Richardson, jr.; Prof. Eva Margarita Steinby. Current sponsors: The Creative Kids Education Foundation; Mr. K. Mathews; D. and J. Rose. Past sponsors: Alitalia, Canyon Video, Design Visualization Partners, Digital Media Interactive, Evans & Sutherland, Intel, KPMG Peat Marwick ICE Division, The Production Group, Stream, Tecnark Italia, UCLA College of Letters and Science, UCLA Office of the Vice Chancellor for Research. How to use the Lab: The Lab is eager to offer its services to scholars and others who wish to create highly accurate and visually stunning 3D computer models of significant cultural sites. How to support the Lab: The Cultural VR Lab relies entirely on gifts and contracts. If you share our vision of bringing the power of 3D realtime models of the world’s cultural heritage to students in the twenty-first century, please become a sponsor of the Lab! Prof. Bernard Frischer, Director, e-mail frischer@ucla.edu, telephone (310) 313-3739; cell phone (310) 266-6935; fax (310) 391-1460. © 2000 Learning Sites, Inc.